- Ask and answer such questions as who, what, when, where, why, and how to demonstrate understanding of key details in a text. - Recount stories, including fables and folktales from diverse cultures, and determine their central message, lesson, or moral. - Describe how characters in a story respond to major events and challenges. - Describe how words and phrases (i.e. regular beats, alliteration, rhymes, repeated lines) supply rhythm and meaning in a story, poem, or song. - Describe the overall structure of a story, including describing how the beginning introduces the story, and the ending concludes the action. - Acknowledge differences in the points of view of characters, including by speaking in a different voice for each character when reading dialogue aloud. - Use information gained from the illustrations and words in a print or digital text to demonstrate understanding of its characters, setting, and plot. - Compare and contrast two or more versions of the same story from different authors or from different cultures. - By the end of the year, read and comprehend literature, including stories and poetry, in the grades 2-3 text complexity band proficiently, with scaffolding as needed at the high end of the range. $4.99 in the Apple iTunes Store. - Identify the main topic of a multi-paragraph text as well as the focus of specific paragraphs within the text. - Describe the connection between a series of historical events, scientific ideas or concepts, or steps in technical procedures in a text. - Determine the meaning of words and phrases in a text relevant to a grade 2 topic or subject area. - Know and use various text features (e.g. captions, bold print, subheadings, glossaries, indexes, electronic menus, icons) to locate key facts or information in a text efficiently. - Identify the main purpose of a text, including what the author wants to answer, explain, or describe. - Explain how specific images (e.g. a diagram showing how a machine words) contribute to and clarify a text. - Describe how reasons support specific points the author makes in a text. - Compare and contrast the most important points presented by two texts on the same topic. - By the end of the year, read and comprehend informational texts, including history/social studies, science, and technical texts, in the grades 2-3 grade text complexity band proficiently, with scaffolding as needed at the high end of the range. Free in the Apple iTunes Store with a $.99 in-app purchase. Libraries are $6.99 in the Apple iTunes Store or $.99 per booklet. Second Grade levels in Reading A-Z are Levels K - P.
- Know and apply grade level phonics and word analysis skills in decoding words. 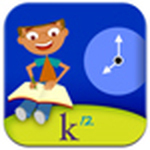 - Read with sufficient accuracy and fluency to support comprehension. b. Read on-level text orally with accuracy, appropriate rate, and expression on successive reading.